Commentators see the imagery used as an indication of China planning to abandon birth restrictions and a likely announcement to this effect by the end of the year. Struggling to address the problem of an ageing population, China has signalled the possible scrapping of its two-child policy and relaxing birth restrictions. 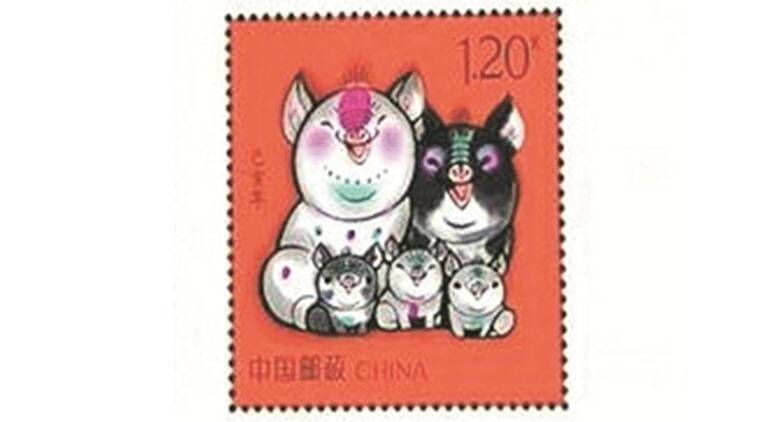 And it started with the unveiling of a new postage stamp — showing a happy family of pigs with three piglets. China Post unveiled the Year of the Pig stamp for 2019 Monday and commentators see the imagery used as an indication of China planning to abandon birth restrictions and a likely announcement to this effect by the end of the year when the country celebrates its 40th anniversary of reform and opening up. There is also a precedent. China Post had released a similar stamp in 2016 — the Year of the Monkey — which showed two baby monkeys. Subsequently, the Chinese government had announced that the one-child policy had been abandoned. The mouthpiece of the Communist Party of China, People’s Daily, had carried an opinion piece the same day the stamp was released, saying that China’s continuing low birth rate was increasingly affecting Chinese society and economy. It also said that raising the birth rate required a systematic national solution. “China’s demographic dividend is dwindling, labour costs are rising and social security pressure is large,” the paper said. China is staring at a looming ageing crisis, with a massively declining birth rate threatening to derail its development. In an attempt to control its booming population in the late Seventies, the Chinese government put in place a restrictive one-child policy slapping massive fines on offenders. For an already heavily populated nation, Chinese officials earlier defended the one-child policy claiming that it had helped avert nearly 400 million births. At the same time, China did reap the benefits of its demographic dividend as its massive population supplied cheap labour to the world’s industries. According to its census, China had a total population of 1.347 billion spread over a total area of 95.96 lakh sq km. The 2017 estimates peg its population at 1.390 billion. In the Eighties and the Nineties, the Old Dependency Ratio, which refers to the ratio of the elderly population to the working-age population, and the number of the elderly population that every 100 people at working ages will take care of was pegged at 8.3. It now stands at 15.9. This has put a greater burden on China’s working young as well as the government which has been forced to run pension schemes and health care systems for the aged. These factors are said to create an even greater load on China’s one-child policy generation, which grew up without any siblings. Once they grow up they will have to face the financial burden of looking after not only their own parents but also four grandparents. Chinese sociologists call this 4-2-1 family structure and say that this will cause the purchasing power of individuals to fall in the long run. According to the UN, it will take China just 20 years for the proportion of the elderly population to double from 10 per cent to 20 per cent between 2017-2037. The UN estimates this could rise as high as 44 per cent by 2050. The low fertility rate in China has further compounded the problem with several people not having children. In China, the prevalent fertility rate stands at 1.57 births per woman which is not enough to replace China’s dying population. The replacement rate that China requires is 2.1 births per woman. In an apparent attempt to ensure that Chinese have more children the government, in 2016, had allowed two children scrapping the one-child norm. Though the number of births that year spiked by 1.5 million the next year they came down again. In 2016 there were 17.86 million births which in 2017 came down to 17.23 million. This hesitancy in having more children was blamed on the exorbitant costs of raising children in China particularly in the urban centres. Experts have now suggested subsidies and tax breaks to encourage people to have more children. Some provinces and cities have been drafting policies to encourage more births. Last month, Liaoning province was the first to introduce incentives for two children. The population development plan (2016-30) issued in July said that the provincial government will provide more incentives to a family of four by decreasing the burden of raising children with improved policies on personal taxes, social welfare and housing.